Samsung is due to expand the Galaxy A series this year with two new handsets: the Galaxy A6 and Galaxy A6+. The new devices will be positioned below the Galaxy A8 and Galaxy A8+, Samsung’s premium mid-range handsets that are borderline flagships. Some renders of the new handsets were leaked online last week and now fresh renders of the Galaxy A6 and the Galaxy A6+ have surfaced. They reiterate the rumors we have heard so far about the design of these devices. 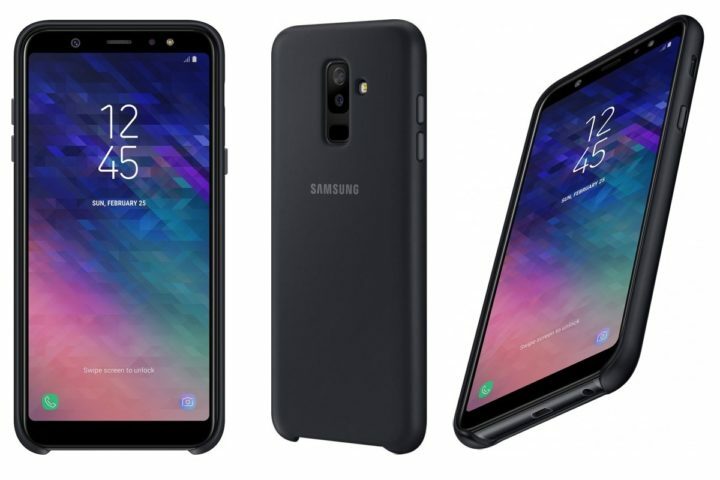 The support page for the Galaxy A6 was recently spotted on Samsung’s official website which suggests that an official launch may not be far off. We also reported exclusively not too long ago that the Galaxy A6 and Galaxy A6+ will be released in Russia, Europe and the Middle East. The new set of renders appear to be for the official cases that will be offered for these devices. We can see that both new handsets will have a flat Infinity Display which also means that the fingerprint sensor will be positioned at the back below the camera sensor. Previous reports suggested that the Galaxy A6+ will feature a dual camera and that possibility has been reiterated by these renders. It’s also going to be slightly larger but otherwise, the design will more or less be the same. These renders also reveal that the device will be sticking with a micro-USB port and won’t be moving up to a USB Type-C port just yet. The standard 3.5mm headphone jack is still present and why wouldn’t it be, Samsung hasn’t even removed it from its flagship smartphones as yet. The benchmark results that have previously surfaced have revealed that the Galaxy A6 and Galaxy A6+ will be powered by an Exynos 7870 and Snapdragon 625 processor with 3GB and 4GB of RAM respectively. They will come with Android 8.0 Oreo installed right out of the box.